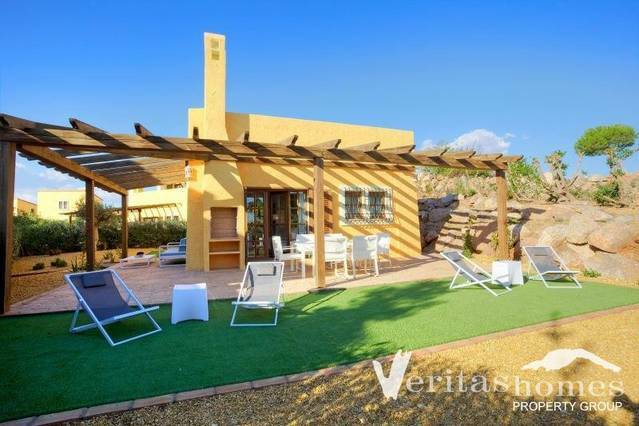 This is a huge detached villa measuring 199m² in the La Algorrobina area of Cuevas del Almanzora. The area is very peaceful with superb views and is located just a few minutes from Desert Springs Golf Resort. The coast can be reached within 10 minutes and the town of Cuevas del Almanzora is just 5 minutes by car for all of your daily shopping needs. The villa sits within a spacious plot of 1054m² with plenty of privacy. The plot is completely walled & gated making it ideal for those with pets. To the front is plenty of off road parking. The front is separated from the rear by mature trees and gates both sides. This home really has a traditional Spanish flavour with a quirky walled Andalucian courtyard that provides lots of shade off the kitchen for al fresco dining. The rear of the property boasts some very desirable features, such as the private pool with extended terracing all around. There is also a double arched shaded terrace from the lounge with retractable sun awnings whilst to the right is a long wooden gazebo with table tennis table and dining area. A roof terrace leads out from the master bedroom with superb views of the mountains to the left & right and a distant sea view straight ahead. This terrace also has a fantastic view of the garden & pool area. On entering the property you will find an entrance hallway with a feature wooden staircase leading to the first floor and a ceiling with timber beams offering that traditional Spanish touch. Straight ahead is a set of glass doors that open into the lounge with Andalucian arch, feature Spanish shelving and a log burning fireplace. At the end of the lounge are further patio doors out to the rear covered terrace. To your left is a small hallway serving the family bathroom with full bath and shower above. Ahead is the fully fitted kitchen with all appliances, granite worktops, breakfast bar and a door out into the courtyard area. To the right of the small hall is the third bedroom which is a large double room with fully fitted, mirrored wardrobes and ceiling fan. On the other side of the lounge is another small hall serving a very large 2nd kitchen / utility area with plenty of units, granite worktops, washing machine, fridge/freezer, dishwasher and small store at the end. This area was created by converting the garage. Next comes the second bedroom with lots of wardrobes, air conditioning, more authentic Spanish shelving and a very spacious en-suite shower room with glass block shower cubicle and towel rail that is heated via the gas central heating system. The final room on the ground floor is a formal dining room with pitched timber beams in the roof which is accessed from the lounge. The room is an excellent size with double window walls which make it light & airy and also benefits from air conditioning. This separate dining room could easily be converted into an additional bedroom, if required. On the first floor is a small landing area with a door on the right leading out to the side roof terrace which is a very generous size and offers superb views. To the left is a door leading to the master bedroom suite. This family suite comprises a very spacious main bedroom, patio doors out to the front roof terrace with distant sea view, air conditioning, an archway leading to another twin bedroom and an en-suite shower room. The owners have created this suite to meet their family needs, but the twin bedroom could also be used as a dressing room or even a small lounge. The versatility of this master bedroom suite offers so much potential. The home is new to the market with Coles of Andalucia. The property can be purchase fully furnished, subject to separate negotiation. To summarize, a striking rural home but close to the beach, golf and town!